Xiaomi has launched a new cross-border e-commerce platform for its Indian customers, which enables them to buy China-exclusive products that are backed by Xiaomi. The platform, called ShareSave, will also provide after-sales services and doorstep delivery for minimal additional charges. Xiaomi has already expanded its ecosystem of IoT products in India and users had to use a third-party app like Banggood to buy these products. With ShareSave, it would now be easier to order them from the China Mainland. 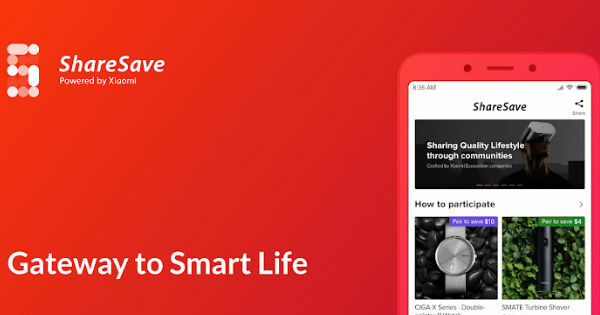 ShareSave can be accessed through a mobile app with the same name and can be downloaded from Google Play store for free. It features three purchase modes – Pair-up, Drop and Kickstart. In Pair-up, users can get an exclusive discount when buying products with friends and can save money. Under the Drop mode, one can get up to 100 per cent discount while buying the products in a group. And in Kickstart, buyers can back a product to get “up to 10 times the reward” by contributing Rs 15. The platform already hosts a ton of Xiaomi-backed products including Yeelight Motion Sensor, electric toothbrushes and more. In addition to these, it provides many devices at a lower price, which are already available in other e-commerce platforms. For example, Yeelight Candela is priced at Rs 4,500 in Amazon, but in ShareSave it is priced at Rs 2,850. As for now, the Xiaomi ShareSave is only available for Android-based smartphones. Xiaomi has not yet revealed any plans for the iOS yet.